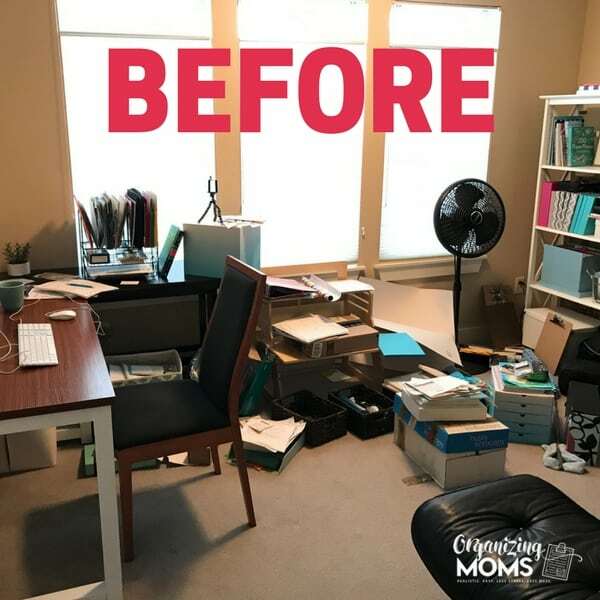 If you’ve been reading this blog for a while, you know that my office space has certainly gone through a lot of transformations over the years. 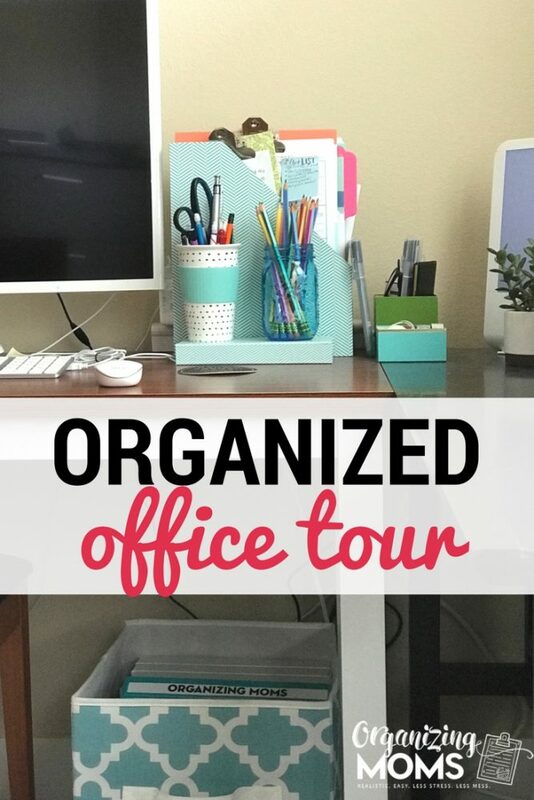 Today I wanted to take you on a tour of the latest re-do of my office space! Usually I make do with whatever setup I have going until it starts to get really bad. Then, I’m motivated to make a change. For me, that motivation came in December, when my office space got REALLY bad. Does this look familiar to anyone out there? I’m pretty sure I’m not the only one who has messes like this, but it’s still sort of embarrassing to put this out there. We were in the process of emptying out our storage unit, and a lot of the boxes and items I needed to go through ended up on the floor near my desk. And, I was holding on to a lot of office supplies and organizers because I thought I still needed them. But, when I really sat down and thought about what components I really NEEDED in my work space, I could see that some of the items needed to go to make room for the things that were working. As you can see from the after pictures, it looks like I got rid of a lot of stuff. 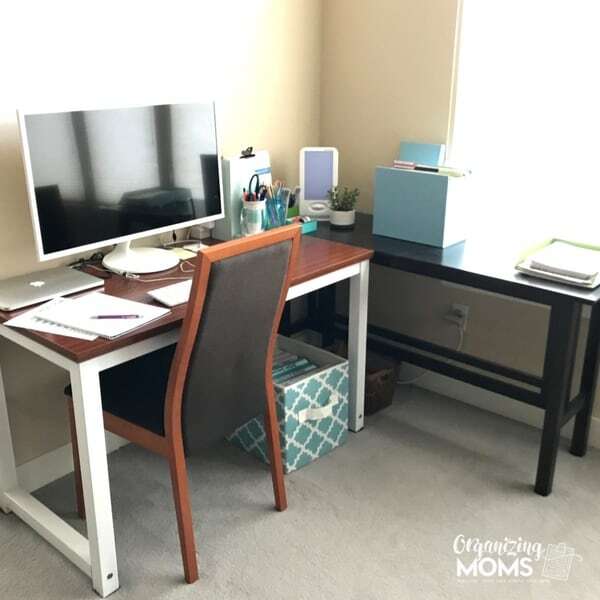 I did declutter quite a bit, but some of the biggest changes came from getting rid of a couple of organizing pieces that were taking up a lot of space. My office area is set up in a little alcove in our bedroom. This isn’t ideal, but it’s what’s available! Our house doesn’t have central air conditioning, but in the summers we keep a window unit A/C in our room. So, if I’m working during the day, I can be in a cooler space. Last fall I invested in a large computer monitor for when I’m doing work for the blog. It’s made a huge difference for me because I don’t have to hunch over to work on my laptop. I also swapped out my previous desk chair for a chair from our dining room! I was having a lot of back problems, and I suspected it might have been caused partially from the chair I was using before. This chair has a little cushion to it, and for some reason, I don’t slouch as much when I sit in it. This all makes my back much happier! I repurposed a box that my watch came in to hold little odds and ends like binder clips, sticky notes, and a pair of eyeglasses for when I’m working on the computer. That weird looking light in the corner? I turn that on to combat the dreariness of the winters in the Pacific Northwest. I’m not sure if it’s really helping me or not, but it makes me feel like I’m doing something to make myself feel better when it just seems to be dark out all. the. time. In my file box, I keep files for current projects. I also hold files that I use for organizing papers, responsibilities, commitments, ideas, etc. I’ve been using the Getting Things Done system to help me get a better handle on all of the things I need to do. 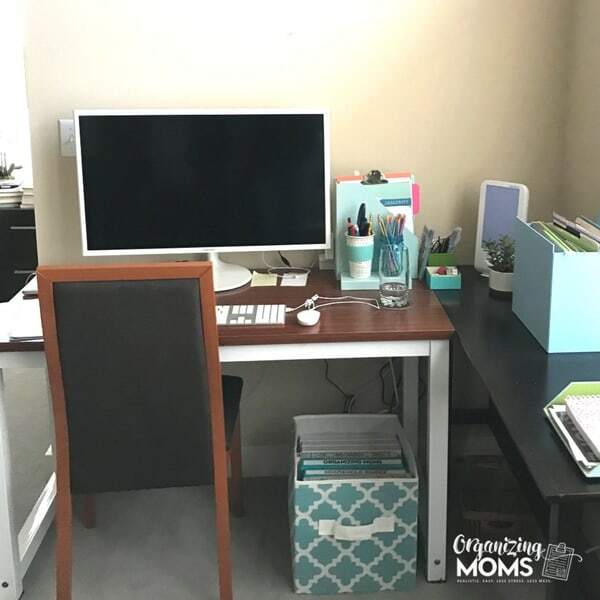 Recently I took a course called Steps to Everyday Productivity that really helped me get this all set up and better understand how the Getting Things Done system works for families. Under my desk, I use a fabric storage bin to store all of my binders. I love to organize with binders! I bought this fabric bin a few years ago at Wal-Mart, but I’m pretty sure they still sell similar bins. One of the most important things I have on my desk is this inbox. It’s where I put everything I need to process that would take me longer than 2 minutes. Every week I do a weekly review and go through all of the stuff that’s in the inbox. If I don’t do the weekly review, it gets bad. Having an inbox helps keep me on track with those weekly reviews, because I can see right away when I’ve let things go too long. 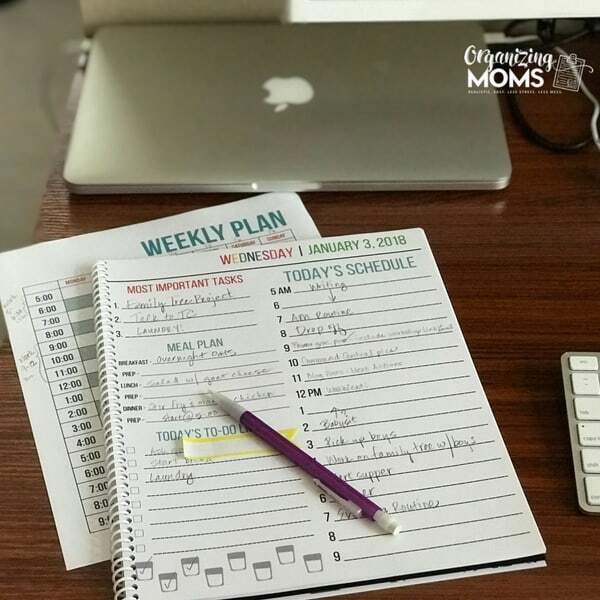 Using my Daily Planning Sheets also helps me plan out what I’m going to work on each day. It has a schedule right on it, so that keeps me from being overly-ambitious and putting too many things on my to-do list. This shelf is across the alcove from where my desk sits. It stores some important things for my office, but I try to only use it for things I don’t need to grab for often since it’s not within arm’s reach. Most of what I have on this shelf is reference, or storage for things that aren’t office-related. Here’s another “after” picture. 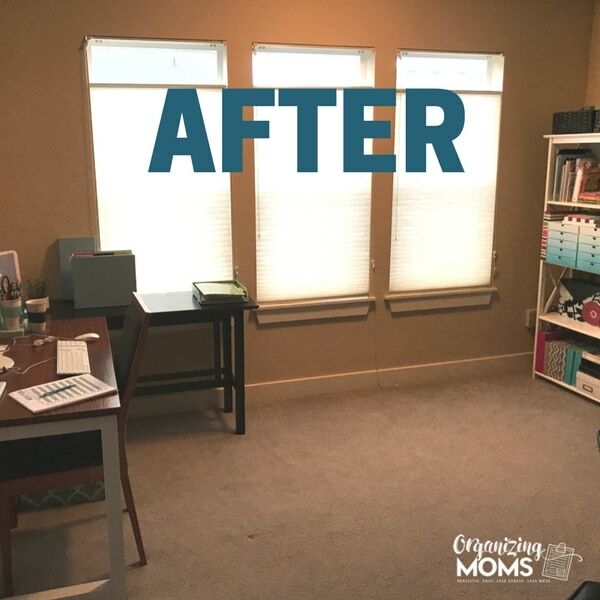 I worked on cleaning up this office space little by little over the course of a couple of weeks, and the results have been great! I feel like I’m much more productive in my little office alcove now that it’s not completely cluttered. 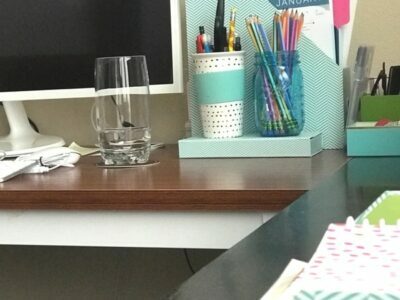 Side table – A repurposed console table – we used this in our living room, but it started falling apart – if I have it up against the wall with the desk on the other side, it sticks together. So, I can’t recommend the actual table I used, but I do recommend using what you’ve got to make your work space functional. Chair – from our dining room table! 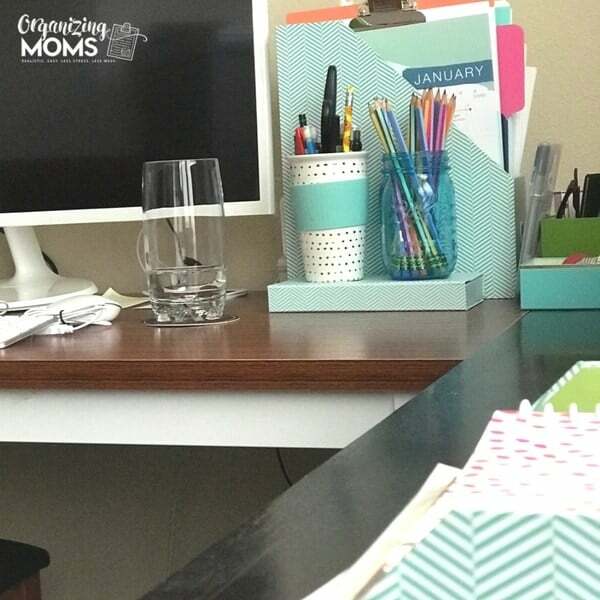 Mason Jar to hold pencils – I also used an old coffee mug. It was starting to leak, but it was still pretty so I gave it a new life as a pencil cup! Bookcase – the one I have is no longer for sale. Here’s a similar one on Amazon. 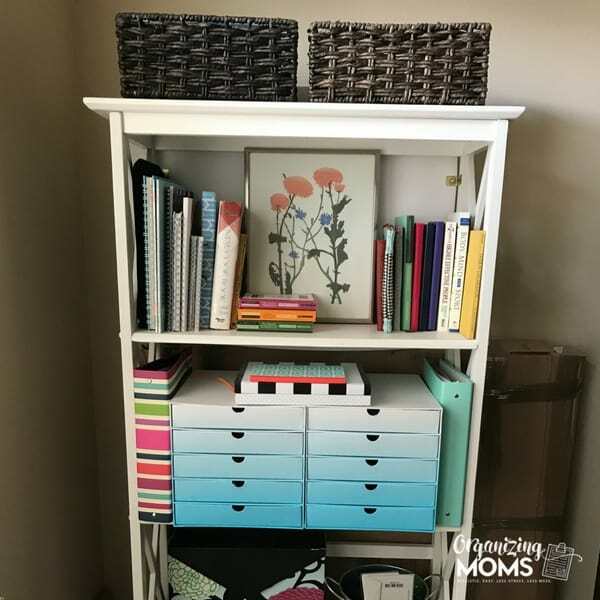 Cardboard storage drawers – from Michael’s in 2017 – Similar. Light Therapy Lamp – I bought mine at Costco a few years ago. Similar. Steps to Everyday Productivity – course to help you set up your own paper organizing system. How to Organize Your Home – 30+ Organizing Ideas from a real home. 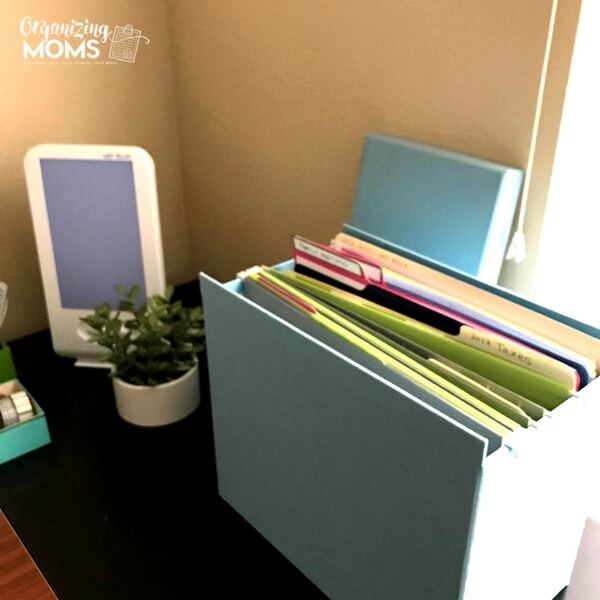 Organize Important Family Information – Be prepared for the unexpected with a Family Organizer. 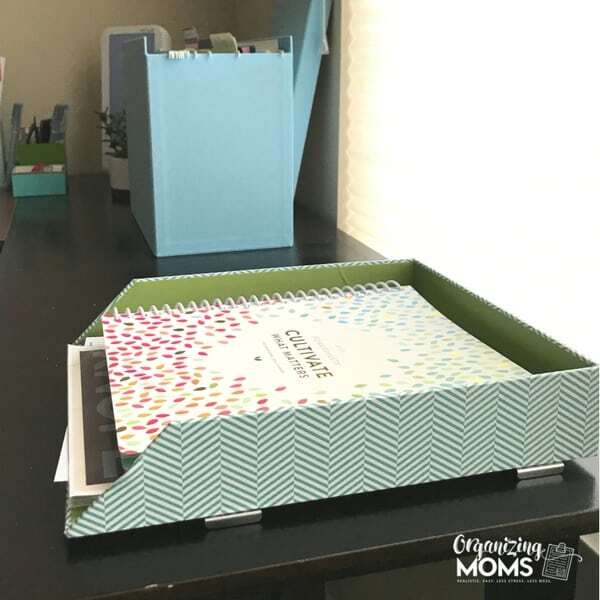 Includes a video tour of a family organizer and tips for making your own! Organize Your File Cabinet – A simple guide to help you organize important paperwork,documents, and records. How to know which important papers you need to keep, and which ones you can get rid of. 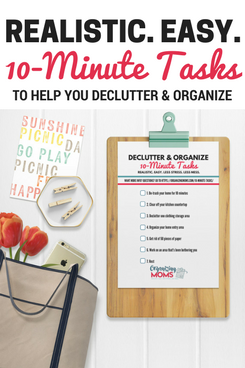 Includes a free printable cheat sheet to use while you’re organizing your important files. Organize Your Printer and Printer Paper – Are you looking for a way to organize a printer and paper ? I couldn’t figure out what to do with our ugly printer and reams of paper for the longest time. In this post, I’ll show how I organized everything and made it easy for my kiddos to access. 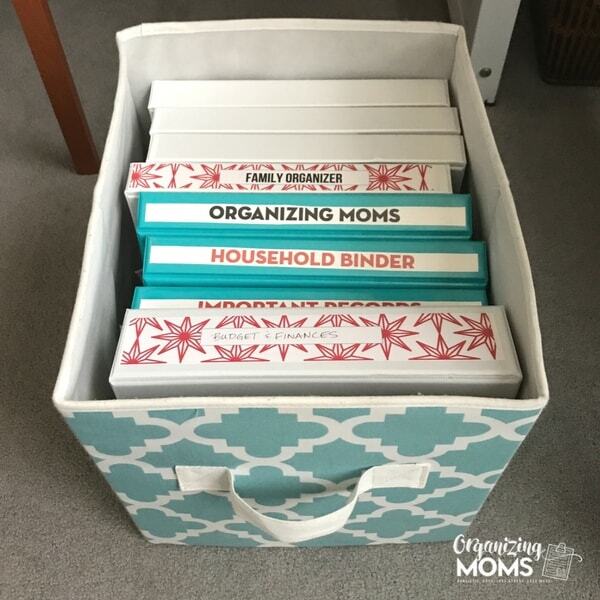 Organizing With Binders – How to organize your home paperwork with binders. A great way to have everything easily accessible. How to set up your own binder.